The use of antibiotics as growth promoters is predominant in the poultry industry until the concern about the development of antibiotic resistance was raised. Withdrawal of AGP from animal diet leaves the livestock and poultry farmers with enormous pressure, as one of the main consequences being a significant increase in the occurrence of infectious diseases (Inborr; Casewell et al.,). Jamroz et al. reported that application of ellagitannins from Sweet Chestnut to the feed mixtures beneficially and statistically significantly affected the dry matter content in the litter in comparison to control. Higher doses of tannins significantly reduced the number of E. coli and coliform bacteria in the small intestine of 28-d-old chickens. The short-chain fatty acids (SCFAs) have an important role in preserving the structural and functional integrity of the gut by limiting the growth of undesirable microorganisms in the gastrointestinal tract of birds, maintaining intestinal pH, improving the solubility of feed ingredients and absorption of nutrients (Adams; Soltan; Adil et al). With the improvement of the epithelial integrity (direct trophic effects) and defense systems, SCFA can act directly or indirectly on tissue development and repair of the gut (Guilloteau et al). SFCA butyrate and urolithin A, produced by lactobacilli and Bifidobacterium from ellagitannins, have been shown to enhance microbial diversity and promote the abundance of bacteria generating this compounds by acting synergistically at the level of the mitochondrion (Franco-Obregón & Gilbert). The present study investigated the effect of a combination of ellagitannins with SCFA on performance and litter characteristics of broilers, in comparison with an antibiotic growth promoter (AGP), bacitracin methylene disalicylate (BMD®). Four hundred and eighty 1-day- old Cobb 400 broiler chicks were procured from a commercial hatchery. The trial was conducted for a period of 42 days in 5 x 5 ft pens on a deep litter floor (rice husk) using a completely randomized design. The experimental design included 3 treatment groups: A basic (corn soya-based mash) diet with BMD (positive control) at 330 g/ton of feed, basic diet without AGP (negative control), and basic diet ET+SCFA (ellagitannin and butyrate) at 500, 250 and 150 g/ton of feed at pre-starter, starter and finisher phases respectively. Each group was replicated 8 times with 20 birds per replicate. The trial was conducted under the standard operating procedure of the test facility to ensure proper animal care and handling. 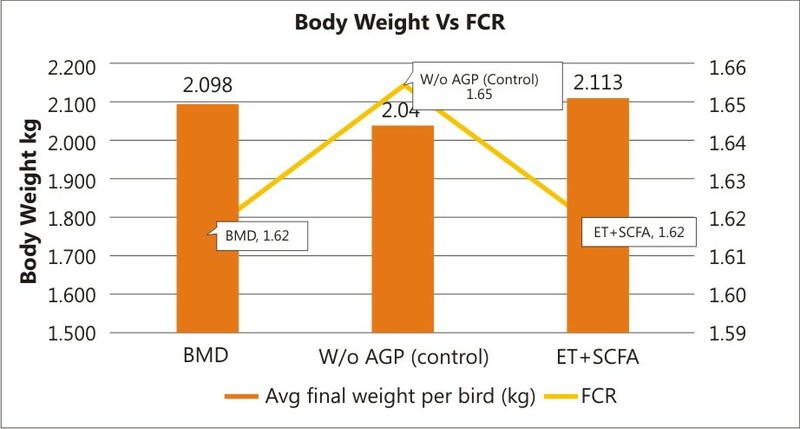 The birds were analyzed for body weight, feed conversion ratio (FCR), footpad lesion (FPD) and litter moister. From day 14 to 28, ET+SCFA group showed similar improvement in body weight as BMD® group compared with the negative control group. Birds supplemented with ET+SCFA showed 3.4% (P < 0.05) more body weight than negative control at day 42. On day 42, reduction in FCR with ET+SCFA is similar to BMD® and also, better than the negative control. Footpad lesions were evaluated on day 42 of the trial. The group with no AGP (negative control), showed a lesion score of 3. Birds supplemented with ET+SCFA had significantly lesser lesion score compared to BMD® and negative control (P < 0.05), suggesting that it had an impact on the litter characteristics. At the end of the trial, it was observed that the inclusion of ET+SCFA has reduced the litter moisture by 18.8% compared with the negative control. It is stated that broilers reared on wet litter developed FPD from an early age, and it progressed severely; when these broilers were moved to dry litter, the disease progression was suppressed or delayed depending on the age of transfer. Being an important indicator of animal welfare, FPD can lead to a significant economic loss for producers, because paws with FPD are not suitable for human consumption. Reduction of ammonia level inside poultry houses is an important part of management to increase birds’ live performance. When there is more moisture in the litter, the potential for ammonia emission from that litter is high. Ferguson et al., 1998 confirmed the relationship between higher litter moisture and increased litter ammonia. Besides the effect on litter moisture, administration of ellagitannins is reported to increase the dry matter content of excreta in Ross 308 chicks (Rezar V and Salobir J, 2014). In conclusion, supplementation with ET+SCFA not only improved the body weight of birds, but also reduced the foot pad lesions by influencing the litter characteristics. Moreover, the improvement was comparable with the antibiotic growth promoter, BMD®. 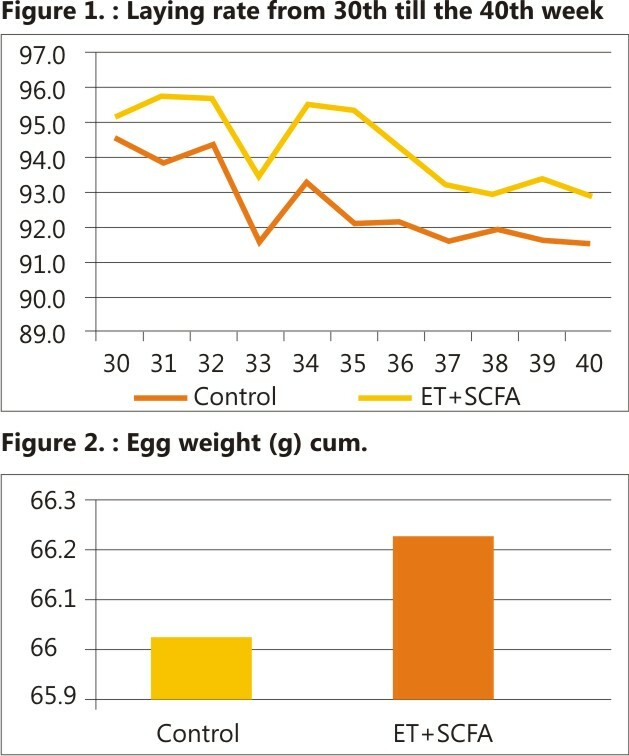 This result indicates that ET+SCFA can act as a replacement for AGP in enhancing the performance of broilers. 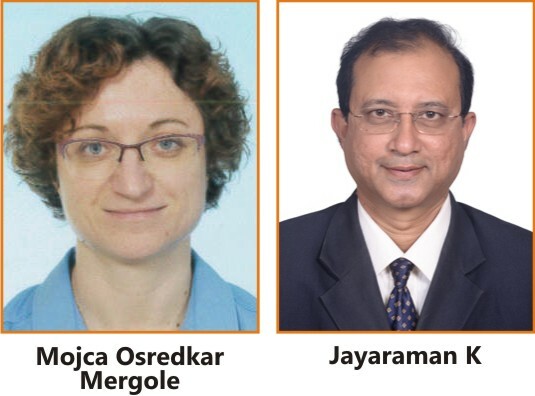 The trial was conducted at the Test station of layers MTD in the Czech Republic to evaluate the impact of the combination of ellagitannins with SCFA on the performance of layers. Hens were kept in environmentally controlled houses in 2 groups, each group had 180 hens. Performance trial lasted from 30th till the 40th week of age. Compared to the control, the addition of ellagitannins with SCFA improved performance of layers with higher laying rate (Figure 1.) and better quality of layed eggs (Figure 2). Another performance test of ET+SCFA was conducted at a layer farm in Croatia with 180000 layers. The trial was performed in 2 layer houses (control and test house) with enriched cages with an aim to evaluate the effect of ET+SCFA on production parameters and health of layers. The trial lasted for 62 weeks, from 18th week until 80th week of age of layers. The measured parameters were: FCR, mortality, laying rate, number and quality of eggs. 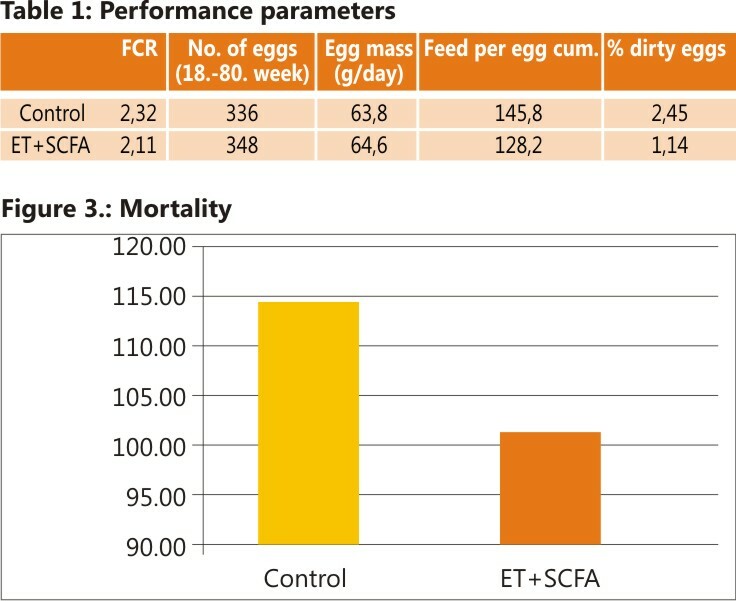 The quality of litter and microclimatic conditions was better in the house 2 (ET+SCFA) compared to house 1 (control) which reflected in improved production of eggs, better feed conversion, less mortality, less dirty eggs and lower feed consumption per egg. Since the start of use ET+SCFA in layer feed, the farm improved: laying rate for 6%, better eggshell quality – less broken eggs for 2-3%, uniformity of eggs for 10%, egg weight for 2g, drier litter, less dirty eggs and better health of hens withoth antibiotics. ET+SCFA combination was tested in 3 layer houses with 2000 layers in different stages in Gorakhpur, Uttar Pradesh, India. Improved performance results for all groups included: solved problem with wet litter, fewer flies, improved egg weight from 53 – 55g to 55 – 58g, improved laying rate for 1 %, less heat stress, improved weight and health status of the animals. 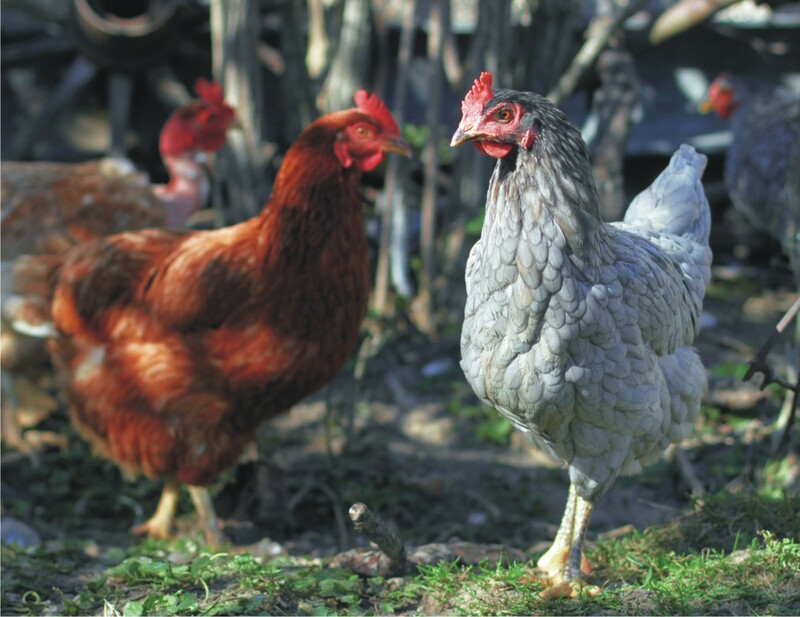 Synergistic effect of ellagitannins and butyric acid brings proven benefits to poultry industry in a new dynamic way together with ever more desired potential for improved performance and cost reduction in a natural way.